Out of Many One: The Proclamation and Abstract Value of Merit by Dufort Baptichon is a meld of a personal story backed by documentary evidence and a hard look into some of the crucial, yet rarely considered values that should guide political life in every society. In the introduction, the author explains the crux of the book in the following words: “The subject matter of this book is the undefined medal of merit that President George Bush has presented to me as member of his political party and the rampant poverty and hunger problems in my native country.” In a very interesting style, the author demonstrates how a medal of merit —something that can be bought on e-Bay for $20 — signed by President Bush and a note to him that stated that the party owed him deep gratitude triggered reflections that resulted in this book. In this book, the author demonstrates how the word “merit” can revolutionize contemporary politics and drive change in incredible ways. This book uncovers the illusions sold by politicians to the people, illusions that hinder them from looking at reality and appreciating values like justice and fair process from a logical perspective. The author weaves historical events into his book, events that are critically analyzed and from which he draws powerful lessons for readers. There are real life, personal stories, and references to his native home, Haiti. In this book, readers will find reflections that will allow them to appreciate politics in a completely new light, to understand the concept of merit and how it can be used to transform the political landscape. According to the author, our modern politics have focused so much on the monetary aspect that humanity is sacrificed on the altar of greed. The allusions to what Libya looked like at the time of Gaddafi is stunning. During Gaddafi's rule, citizens enjoyed free electricity and no taxes, bank loans with no interest because the banks belonged to the state, the right to own a house being a fundamental one with the state giving $50,000.00 to all newlyweds to purchase their own home. Citizens enjoyed free education and medical care. Isn’t it surprising that the person who brought these changes to Libya should be pursued and shot like a dog? 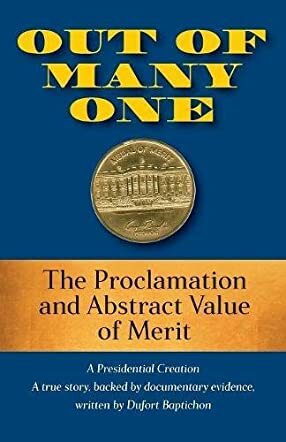 Dufort Baptichon’s Out of Many One: The Proclamation and Abstract Value of Merit is a revolutionary book, and even if the writing isn’t top-notch, it has facts and asks questions that will create an awareness that can revolutionize politics. It’s a must-read!